Popular seed spacing chart pdfs can be downloaded via the links below. If you're looking for a chart you don't see here, please contact us as we may have it available to email, fax, or mail. Seed spacing for Clean Seeder AP and Jang planters is based on the number of cells in the seed wheel + sprocket combination. Commonly used seed wheels have 3, 4, 6, 8, 10, and 12 cells per wheel. Less common wheels have up to 30 cells per wheel and can have irregularly shaped cells. 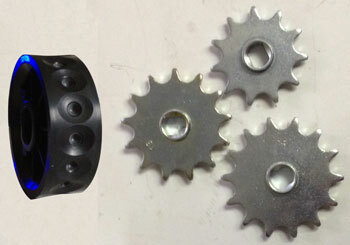 All available wheels are listed on our Seed Metering Wheels page and can be purchased in our online store..